Hip dysplasia. Your dog has elbow or hip dysplasia. You can’t reverse the disease, but you would if you could. Don’t despair though; there are things that you, as an owner, can do to help reduce your dog’s pain. Consider the following six ideas on ways to combat elbow or hip dysplasia pain. What is Elbow or HipDysplasia? To start, let’s get a basic understand of what dysplasia is. For this article I’ll refer to hip dysplasia in particular. 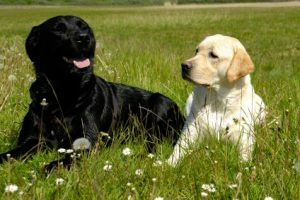 Hip dysplasia has a huge genetic component, but that doesn’t mean that dog without genetic predisposition can’t contract the disease. In fact, feeding your dog a healthy diet from an early age can greatly reduce your dog’s risk of developing hip dysplasia, even if your dog is genetically predisposed to the disease. Hip dysplasia occurs when the hip joint doesn’t fit together correctly. The hip joint is a ball and socket joint. What this means is that the ball of your dog’s hip joint (the top of the leg bone) fits perfectly into the socket of your dog’s hip. When a dog begins to develop hip dysplasia it is because that ball or the socket begins to deform. As this happens, the lubrication that keeps the joint working smoothly, and the ligaments that keep the hip connected begin to degrade. The joint may begin to develop spurs, resulting in very painful movement. Currently there is no way to reverse this process once it begins. As I mentioned, a great way to prevent or slow the onset of hip dysplasia is to feed your dog correctly. Dogs who are overweight are much more prone to contracting hip dysplasia. Think about how much more pressure an overweight dog puts on their joints compared to a dog at a healthy weight. The more weight your dog’s joints have to bear, the more prone they are to wearing out faster and developing hip or elbow dysplasia or arthritis. Talk to your vet about your dog’s chances of developing hip dysplasia. Some breeds (often large breeds) are much more prone to developing the disease. Your vet will be able to recommend a proper diet for your dog, if she is in fact prone to hip dysplasia. Even if your dog isn’t genetically prone to the disease, your vet should be able to help you find the best diet for your dog. Exercise is a double-edged sword when it comes to dogs suffering from bone diseases. Obviously you don’t want you take your dog with you on a twenty-mile run, but you do want her to get some exercise. You want your dog to move her joints. Moving her joints, even if she suffers from hip dysplasia, can help her body produce lubrication which allows her joints to move with less pain. Another thing exercise does is keep your dog at a healthy weight and help her maintain muscle tone. Better muscle tone will help combat hip dysplasia. Another great thing you can do for your dog is give her a massage. If your dog does have hip dysplasia, giving her a massage around her inflamed joints can help reduce the pain and make that inflammation dissipate. You need to be careful when doing this though. Your dog’s joints are sore, and she might not understand that you want to help her if you just jump right in and start touching painful areas. Build up to massaging your dog’s sore areas by first petting her, then petting the sore areas, then beginning to kneed the areas. 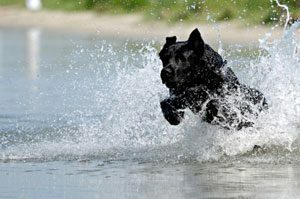 As I said, some exercise, like walking or swimming, can be good, in moderation, for dogs suffering from hip dysplasia. Things like climbing stairs or jumping after a toy or into a car are not good for your dog. A great way to reduce the amount of pressure on your dog’s joints is to get her a ramp. If she needs to get into a car, use a collapsible ramp. This will allow your dog to get into your car easily and without putting excess pressure on her joints.